In September, Redemptorist James McCabe was ordained a transitional deacon. 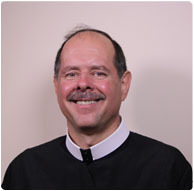 He expects to be ordained to the priesthood in June 2011. Until then, he’s spending his diaconate year at St. Martin of Tours Parish in Bethpage, NY. As he moves closer to priesthood, we’ve invited Deacon McCabe to write a monthly blog about his ministry experiences and the ways God is using him to bring the message of plentiful redemption to the world. His blog will begin in January. We don’t know John’s feelings, but I would be angry at the least. After all, he was rotting in prison, had preached a message of repentance, and here was Jesus saying the outcasts from society would be cared for — what about him? Did John take offense at Jesus? I don’t know, but I do know I take offense at times because my prayers are not answered in the affirmative — people continue to be sick, unemployment is around 25% and many people have been out of work for years. But I also know and believe this same Jesus is with me regardless of my situation in life. Jesus preached a message of hope that he is with us. A message that provides my fellow human beings and me the hope to continue to do good, and to improve our lives and the lives of others. This hope is rooted in the Spirit of the risen Christ, The Holy Spirit. The Holy Spirit has been around forever and was with John the Baptist in prison, and that same Spirit is with all of us today. May God bless you in this Advent season, and may Our Redeemer bless you abundantly this Christmas.